For setting bevels, transferring angles, small squaring tasks, checking cutter clearances within certain limits, and many other applications. 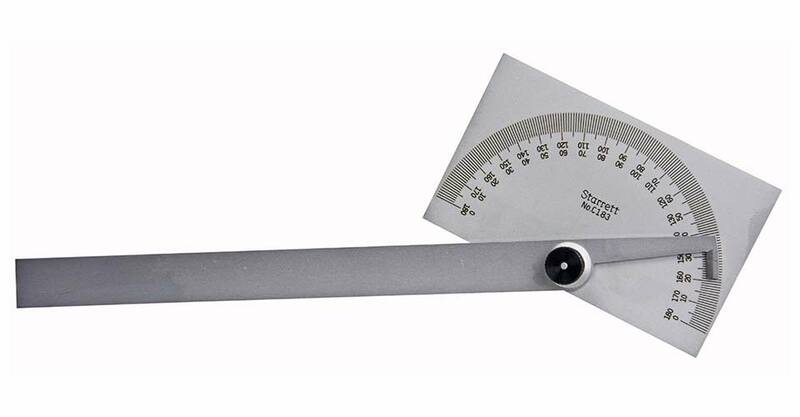 These protractors feature double graduations for 0-180° in opposite directions permitting the direct reading of angles and supplementary angles. The back of the tools are flat for ease of use. Satin chrome finish for ease of reading and resistance to rust. The Starrett #183 Protractor with Locking Blade features a blade that can be locked firmly at any angle by the lock nut. Rectangular head provides four convenient working edges.